Celebrate the your loved one with these "I LOVE YOU" sweets! All handmade, these detailed, bite-sized pieces of candy are not only wonderful to look at, but very delicious to taste. 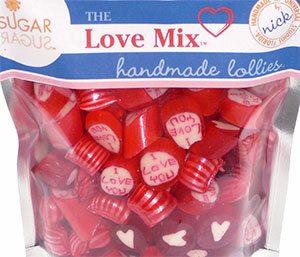 The flavors in the Love Mix are watermelon "I LOVE YOU" lollies, cinnamon pillows, and cherry hearts. - Resealable zipper-type pouch bag, net wt. 8 oz. (226g), measures 8" H x 5" W.